Two perfect tips for learning your canter leads. 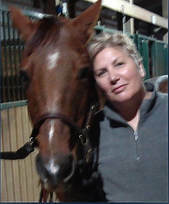 A reader asks, "How can I tell when I'm on the correct canter lead?" The canter is a three-beat gait. You want the right lead when you are tracking right (circling to the right) and the left lead when you are tracking left. The horse in the video above (from Wikimedia) is on the right lead. Here is a brief video that shows a horse on the right lead canter in slow motion. Notice that the right fore is slightly ahead of the left fore when the horse is cantering. Look at the front feet: Ask for canter (usually by tapping your horse with the heel of your outside leg). Then lean forward just enough so you can see your horse's front feet. If the left front hoof appears before the right front hoof, you are on the left lead. If the right front hoof appears before the left front hoof, you are on the right lead. If you're on the wrong lead, bring your horse back to a trot and ask again. Focus on what you're feeling: Once you're on the correct lead, focus your attention inward on your body. Pay attention to how your body feels while the horse canters. Your pelvis should feel as though it is doing a mini-hula on a swing (seriously, that's what it feels like), circling slightly from one hip to the other hip and then forward toward the horse's withers in a smooth gliding motion. Then put your horse on the wrong lead and feel how much bumpier and off-balance you feel in the saddle. It also helps to have someone on the ground to tell you when you are on the correct lead and when you're not. When they say you are, again focus inward and pay attention to what you are feeling in the saddle. Do the same when they say you aren't. If you do this enough times, you'll be able to tell yourself because you've become more aware of what the correct lead and incorrect lead feels like. There is something called a cross-canter in which the horse is on one lead in front and a different lead in the hind. It feels awful. If your horse ever feels tremendously bumpy and off-balance in canter, she may be cross-cantering. Bring her down to a trot immediately. If you're not sure whether your horse cross-canters, ask for help from an experienced rider who can tell you by watching from the ground.